HOUSTON, September 21, 2011 --- Today, Jiffy Lube International -- the company that pioneered the quick lube industry -- announced Fuelman as a key addition to its roster of fleet customers. Fuelman -- a leading independent provider of commercial fleet fueling services and a division of FleetCor Technologies, Inc. -- is looking to Jiffy Lube to help drive expansion into the preventive maintenance space and offer customers a broader variety and consistency of services. The Jiffy Lube Fleet Care℠ Program is a valuable resource for fleet preventive maintenance needs. The new relationship with Fuelman means thousands of added vehicle visits to Jiffy Lube service centers in the next 12 months. "Expertise, speed and convenience are three characteristics every customer -- consumer or business-to-business -- values. The relationship we've developed with Fuelman shows how respected our services and brand are in the industry," said Mike McFadden, Fleet Sales Manager for Jiffy Lube International. Fuelman helps businesses and government entities manage and reduce their fuel expenses and maintenance services. Jiffy Lube is the Fuelman network's first national quick lube provider; now, Fuelman FleetCard customers can visit any of the 2,000-plus Jiffy Lube service centers across the country for preventive maintenance services, such as the Jiffy Lube Signature Service® Oil Change, to help extend the life and value of their vehicles. "We chose to join with Jiffy Lube because of their quality service, national footprint and strong reputation in the marketplace," said Jim Prantl, VP, Merchant Services for Fuelman. "Fuelman customers now have access to quick and consistent Jiffy Lube services and a provider with a deep understanding of their business." Visit JiffyLube.com for more information about the Jiffy Lube Fleet Care℠ Program and to find oil change coupons and promotions, Jiffy Lube news articles, community involvement programs and events, franchise information and employment opportunities. Also, anyone can visit the Jiffy Lube Facebook community, "Keeping My Ride Alive," to view photos and stories from drivers committed to extending the life of their vehicles, as well as upload photos and stories of their own. Jiffy Lube International, Inc. ("Jiffy Lube"), with more than 2,000 franchised service centers in North America, serves approximately 24 million customers each year. Jiffy Lube pioneered the fast oil change industry in 1979 by establishing the first drive-through service bay, providing customers with fast, professional service for their vehicles. 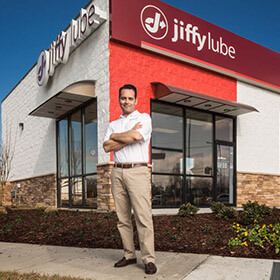 Headquartered in Houston, Jiffy Lube is a wholly owned, indirect subsidiary of Shell Oil Company. Visit www.JiffyLube.com to learn more about Jiffy Lube and vehicle care.